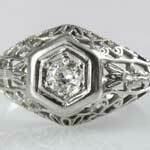 Feminine ladies old European diamond 1930s gold filigree engagement ring. 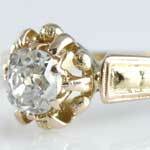 Traditional estate ladies diamond solitaire engagement ring in white and yellow gold. 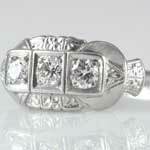 Twin diamonds glisten above a field of diamonds in this estate diamond wedding or right hand platinum ring (1.50 ct tw). 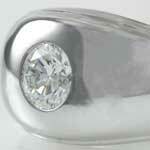 Simple, classic mens estate diamond wedding band in 14kt (585) white gold (0.65 ct, VVS2, F). 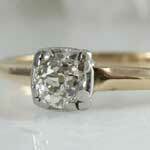 Classic estate 1/3 carat old diamond engagement ring in yellow gold. 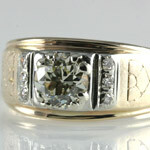 Gentleman's 1 carat old European diamond gold wedding ring (1.12 ct tw, VS1, M). 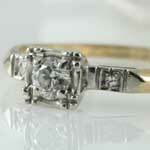 Stunning old mine-cut diamond solitaire antique wedding ring (0.67 ct wt, SI1, G). 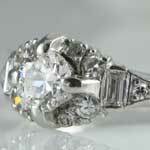 Capture the beauty and radiance of old European-cut diamonds in this antique 1 carat diamond platinum wedding or cocktail ring (1.01 ct tw). 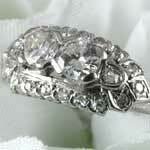 Attractive estate three diamond platinum wedding ring adorned with flowers. 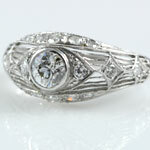 Exceptional beauty and quality is found in this estate early 1900s old European cut diamond platinum engagement ring (VVS1- VVS2, G-H, 0.71ct tw). 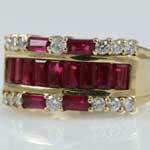 Stunning vintage natural ruby and diamond gold band ring in 18kt 750 yellow gold. 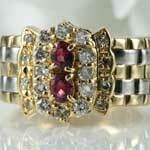 Stunning estate natural double ruby diamond ring in braided platinum and 18kt yellow gold (R 0.51, D0.52).